What I did: In the morning, Wendy had her weekly Career Breakfast where we talked about cover letters and resumes. It was interesting to hear about different strategies and examples of highlighting my technical skills and my project. yesterdays data processing in function form! I did figure a way around it – but its not my ideal. 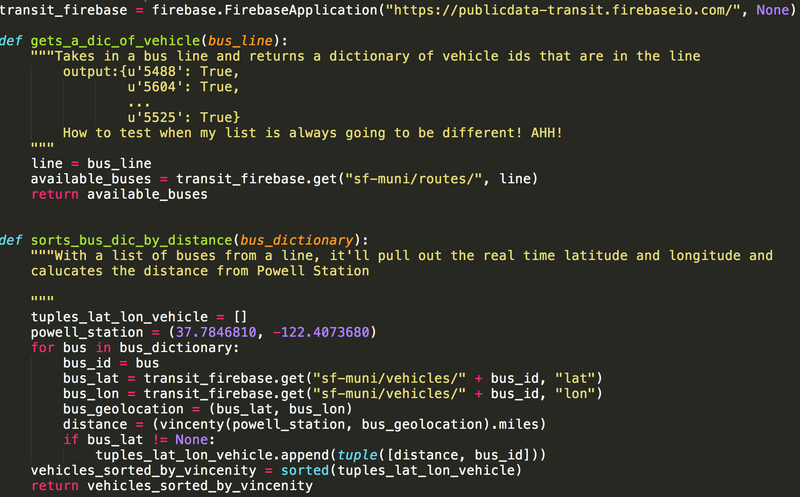 I can write it through python (my server/program) to “call” to Firebase every minute when something is in my queue and then grab from Firebase the updated latitude and longitude of the bus and do the math on my end when it reaches the threshold. It just seems really silly to do it this way since Firebase can handle it. I spent most of the day helping other girls with their projects and talking to give myself time to process this. I’m just happen that I have a back up. 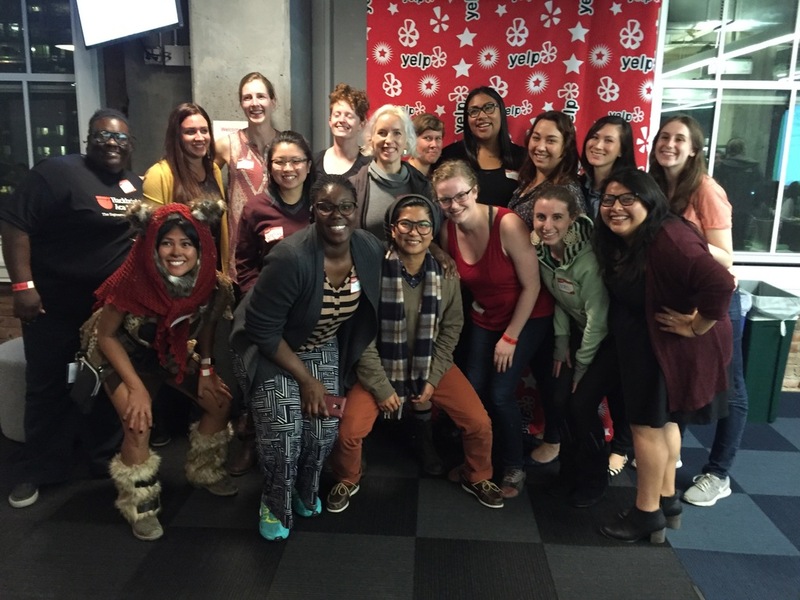 I have a event this evening at Yelp: “WE Speak“where three female engineers are going to share their projects and experiences at Yelp. The talks were amazing and I have better appreciation of how things are done and processed now that I understand the technology more. I met tons of amazing women, but I really connected with Jenny from yelp and Alyssa from square. Jenny is one of the organizers for Yelp’s AWE (Amazing Women in Engineers) and Alyssa is organizing a similar event at square. Its so refreshing to find more amazing women. Blockers: how to test functions when its real time data? My Thoughts/Process: Today was not as “productive” as I was hoping. I hit a point where I need further support for the firebase event handler. Most likely I’ll ask Joel tomorrow (he was out today). But my energy was low, I felt tired and sleepy. I did realize that when I have a process or perceived notion of a “plan” its taking me a bit to recenter. I am normally really strong with flexibility, but I’m assuming its because this is all new to me, my poor little brain needs time to process. The event at Yelp was so much fun. I love meeting new people with similar passions and ideas. It really rejuvenated me to continue working hard so I can be part of this amazing circle of people.